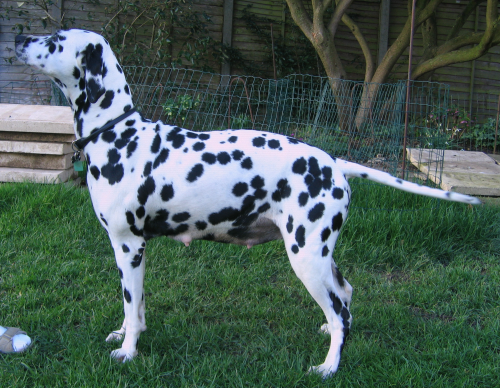 Well Mary and Stilman asked us a question the other day about Dalmatians and cats. Well I suppose generalising, the question becomes one of dogs and cats really. You see we have always had dogs and cats, except for a 2 year gap where we lost our dear spaniel Peter at 16, who thankfully went in his sleep over night. Although very shocking to wake and find him, we believe that it is the best way for them to slip away, of their own accord. But unfortunately this is not always possible. Anyway back to the dog and cat question. Our dogs have always got on well with our cats. We had cats first and dogs came along afterwards. Peter and Penny our sibling spaniels came first at 17 weeks old (we rescued them) when the cats were around 2. They cats were very wary to start, but we allowed them all to mix at all times and if things got a little rough, we would just step in briefly and thats all that would be needed. Peter and Penny rarely paid any attention to them except to greet them when they appeared. In fact when my boys were young, we all used to go for walks down the lanes, cats and all. There were a few wry smiles from the few neighbours we had I can tell you. In fact we would quite often meet a tractor and it got to the stage where they would wait for us pass and if they hadn’t seen the cats, they would wait till they came round the corner!!! Sometime later our cats passed away and soon others entered our house. Brothers again funnily enough. They came as kittens and the dogs took to them straight away. Now I am not saying that the dogs didn’t chase them, because they did, but it’s not a “I will catch you and when I do, I will eat you”, chase. The cats would run and leap onto a wall or fence and sit there tails twitching whilst hanging down just out of reach of the dogs! The cat would then proceed to walk up and down the said wall or fence teasing the dog. Now cats will sometimes stand their ground and it’s usually those do that usually manage to get away without being chased. A non agressive dog is not going to push its luck with a cats claws!! So our household now? Thomas, a shy very old cat who prefers to keep himself to himself, but will on occasion come face to face with Molly or Marcy round the corner of the house. He runs, they chase. He goes to his bolt hole. Chumpsey, a very cheeky stray we rescued, Moll’s best mate till Marcy came along. They would play under the dining table, Chumpsey’s head very often insde Molly’s mouth!! Outside he rolls over for her, she sniffs and then the chase is on!! He also brings his spoils back, hoping to get praise from us and the dogs, all he gets is daylight robbery, straight out of his mouth!!! Now Marcy, well she is still learning and Chumpsey is still teaching her. She hasn’t yet been warned with his claws, so no scars to date. But if she keeps barking at him it won’t be long. She’ll quite often come across him in the garden; they stand, they stare, she runs, he bolts straight to the wall, then proceeds to prance up and down teasing again. Marcy tries to get at him, but to no avail (the cats not stupid!! ), she gives up and that is it till next time. Now I know the cat’s tactic is working, because when I let the dogs out in the evening, Chumpsey is there waiting. The dogs? nothing! a sniff each “where you been, what did you catch” then on to do their business. So why has it been so easy for us to have both dogs and their arch enemy the cat, in the same household? I believe it is because we allow them to mix and to set the heirarchy between the species themselves. If it gets a little rough, we step in. It doesn’t hurt the dog to be on the receiving end of a claw occasionally (as long as they dont get an eye!) It is the cat that generally sets the standard. And although it may seem that when the chase is on, the dogs in charge, they aren’t. A great way to get a cat and a dog used to one another is to let them occupy the same room at the same time. Indoors, where you are able to oversee the interaction. That doesn’t mean shut them in the same room, just let them have access to the same rooms. They will eventually get used to seeing each other, passing each other (quite often with a warning strike from the cat as they pass!!) and eventually living with each other. I will finish this piece by saying just one thing though. You will know from the start if the interaction between your dog and your cat is an aggressive one on the dogs part, or if it’s just play or testing boundaries. Obviously if it proves to be agressive then this a competely different scenario and you may just need to resign yourself to the fact that dog and cat won’t mix and the cat will probably need it’s own area in which to get some peace. Well I hope our experiences help any of you that are having any cat /dog issues. As animal lovers we do have to contend with issues that sometimes we could well do without. But what boring lives we would lead without it being blessed by our nutcase animals!!! Best wishes to everyone from Liesel. Unfortunately, Marcy (Tolutim Evensong) has undergone an emergency operation to remove an obstruction from her gut. She is doing ok at the moment, but we are taking every day as it comes, since abdominal surgery is very risky because there can be quite a few complications. Marcy had manage to get hold of one of my socks and somehow eaten it whole. I very rarely let her out of my sight and when I do it is only for a minute. This however was more than the amount of time it takes to gulp down a sock! Marcy had her tea on Wednesday night and it must have been after this that she managed to put away the sock. It wasn’t until the morning that she started to vomit bile, and was doing so with a deep stomach wretch which I thought was unusual. We took her straight into the vet who felt around and thought that certain parts of her gut felt very gassy and tight. They x-rayed her and discovered a large blockage. Luckily we had caught it early and the gut was still healthy. A tip … if your dog is vomitting continuously and very deeply, don’t leave it too long before you check with the vet. Getting at a blockage early can save a life. Please please take head, no matter how well you think you are watching your puppy, they are always able to find something. They are crafty thieves. Marcy had taken the sock off the kitchen table. I had put the washing on there after bringing it from the line. If they manage to get hold of something they shouldn’t have, they hide it in their mouths and gulp when they hear someone coming. Even the things that one thinks are ok for the pups because they are supposed to be toys can cause problems. Never let them play unsupervised. I will keep you all informed on her progress. Puppies are crafty and fast, re-evaluate your home and make sure it really is puppy proof – I thought mine was, I was wrong.